Bustling, tranquil, historic and cutting-edge, all at the same time – Amsterdam is an incredible city! A Dutch course in Amsterdam will reveal priceless artworks, buzzing bars and clubs, cosy cafés, shimmering waterways and everything else you could imagine! What’s more, Dutch people are renowned for their friendliness, so there’ll always be someone to practice your new vocabulary with. 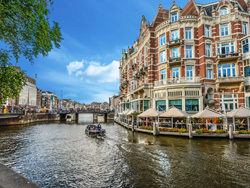 Amsterdam hosts many fine art galleries and museums, including the Hermitage, the Anne Frank House and the largest collection of van Gogh’s work in the world. Visit the Jordaan district for boutique shops, elegant eateries and fashionable markets. The area around Leidseplein square, meanwhile, is home to popular nightspots and the verdant Vondelpark. Whether you explore the city by foot, bicycle or boat, you’ll soon fall in love with Amsterdam! Our school offers Private Dutch Lessons in teachers’ homes. As tuition is on a one-to-one basis, your course will be tailored to suit your own specific requirements, and your teacher’s only aim will be to improve your Dutch! Choose 10, 15, 20, 25 or even 30 sessions per week, depending upon how quickly you would like to progress. Learning Dutch in the Teacher’s Home, you’ll be able to practice your language skills all the time! You can chat after class, over meals and whilst your teacher shows you the sights. Your teacher will provide you with a single room, three meals per day and a warm welcome! Living with your teacher is not only very convenient: it also gives you the chance to become completely immersed in the local way of life. Our school will endeavour to match you with a teacher whose background and interests are similar to your own, helping your stay go as smoothly as possible and giving you plenty to talk about! To supplement your Dutch course in Amsterdam, your teacher will plan a variety of extra-curricular activities. Whether you’re watching Dutch language films, sightseeing in Amsterdam or touring a museum, activities are a chance for you to enjoy yourself and get yet more Dutch practice. Amsterdam Airport Schiphol is one of the busiest airports in the world and handles flights from across the globe. Our school offers one-way transfers from the airport, for an extra fee. I stayed with Irene 13 years ago and it was almost as if we could continue our conversations. I learned a lot of Dutch and hope to return in five years. She is German, so we also spoke some German in addition to Dutch, so I learned twice! It was actually a lucky incident to have a second person there. The other lady was already fluent in Dutch, so since I was not able to talk so much in Dutch (because I was a total beginner) it helped a lot to listen to them talk the whole day and sit in their lessons as well. For me it was the perfect combination to have 1:1 lessons with Irene and then having people around me talk all the time, which let me learn probably much more in these just two weeks, than I would have learned being there alone. It was a lovely home in a lovely part of Amsterdam. Everything was kind of close to reach, but at the same time you had kind of a little park to relax directly in front of your door. 15 of my favourite Amsterdam food and drink places! Hello everyone, Maria here! Amsterdam is my favourite city in Europe. Six years ago, my mother and I established a new tradition of spending a few days in Amsterdam together, once or twice a year. It is our kind of mother-daughter ritual and she has different ones for each of my sisters as well. That way, each of us girls can spend a weekend getaway with our mum alone. I now know a few interesting places that Amsterdammers swear by. Here is my list of my 15 favourite places for food, drinks & books in Amsterdam, The Netherlands!